Software in the near ubiquitous future (Softure) will need to cope with variability, as software systems get deployed on an increasingly large diversity of computing platforms and operates in different execution environments. Heterogeneity of the underlying communication and computing infrastructure, mobility inducing changes to the execution environments and therefore changes to the availability of resources and continuously evolving requirements require software systems to be adaptable according to the context changes. Softure should also be reliable and meet the users performance requirements and needs. Moreover, due to its pervasiveness and in order to make adaptation effective and successful, adaptation must be considered in conjunction with dependability, i.e., no matter what adaptation is performed, the system must continue to guarantee a certain degree of Quality of Service (QoS). Hence, Softure must also be dependable, which is made more complex given the highly dynamic nature of service provision. Supporting the development and execution of Softure systems raises numerous challenges that involve languages, methods and tools for the systems thorough design and validation in order to ensure dependability of the self-adaptive systems that are targeted. However these challenges, taken in isolation are not new in the software domain. 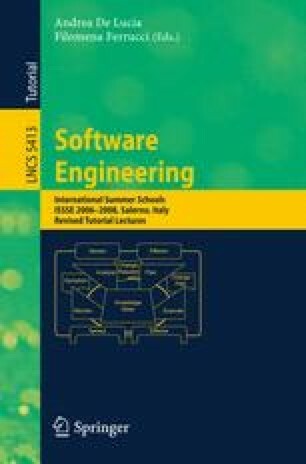 In this paper we will discuss some of these challenges and possible solutions making reference to the approach undertaken in the IST PLASTIC project for a specific instance of Softure focused on software for Beyond 3G (B3G) networks. This work is a revised and extended version of . It has been partially supported by the IST project PLASTIC. We acknowledge all the members of the PLASTIC Consortium and of the SEALab at University of L’Aquila for joint efforts on all the research efforts reported in this paper.